It's funny how many career-defining moments almost never happen. This week in 1984, a single debuted that would completely revitalise a female artist's career, but the song had been offered to a number of different artists previously. If any of them had decided to record it, things would have played out very differently. Of course, the singer did release it and it not only solidified her musical comeback but it went all the way to number 1 in Australia. Not bad for a song she wasn't that fond of. The number 1 song in the country this week in 1984 was still "Wake Me Up Before You Go-Go" by Wham!, which held off Prince's "When Doves Cry" for a second week and spent its fourth week overall on top. 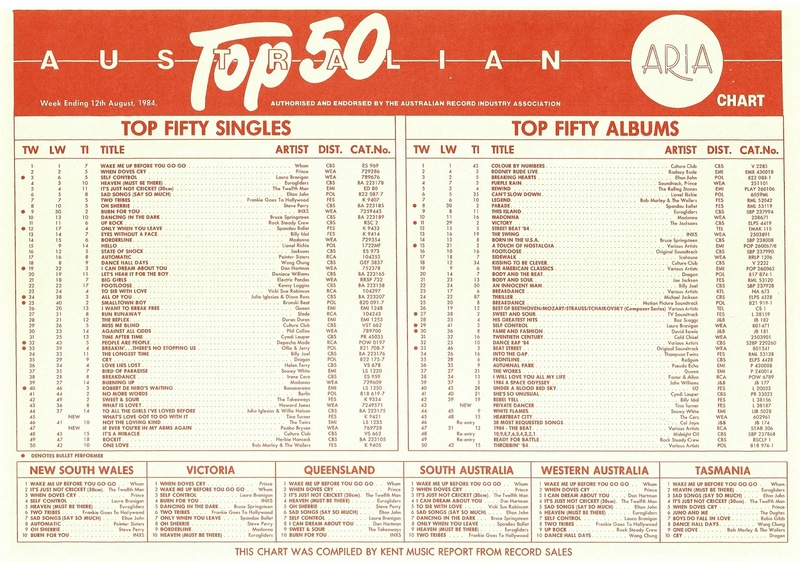 A final top 100 appearance for the Australian singer/actress who'd previously come close to topping the chart twice. A stand-alone single, I wonder if it had been intended as the lead release from an album to follow-up 1983's Colleen that never eventuated? 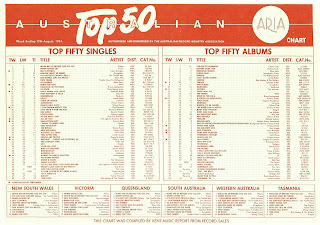 The first single from Body & Soul just made the top 50, this second one was lucky to creep into the top 100 despite being one of Joe Jackson's best songs (and a US number 15 smash). Three singles from Footloose had reached the top 50 and the movie's "love theme", which was co-written by Eric Carmen, became the third to miss the mark. Vocals on the big ballad were handled by the singers of Loverboy and Heart (respectively). This synth track by the German electronic legends was actually remixed and re-released around this time after featuring in Breakin', but this Australian single seems to have included the original 1983 mixes. In the '90s, he performed on two big hits that provided Disney characters with sweet romantic moments, but in the '80s, his two ARIA chart appearances came with songs that daytime soap characters made passionate love to. Following 1983's "Tonight, I Celebrate My Love" (which featured in Days Of Our Lives), Peabo Bryson returned with his only solo top 50 hit, which was used in Santa Barbara as the theme for characters Joe and Kelly (who was played by Robin Wright). The stirring ballad - the key change soars! - was composed by three songwriting legends: Michael Masser (who'd also co-written "Tonight, I Celebrate..."), Tom Snow ("You Should Hear How She Talks About You", "Let's Hear It For The Boy") and Cynthia Weil ("Running With The Night", "Don't Know Much"). With talent like that behind it, no wonder it was big - as well as its top 20 peak locally, it gave Peabo his first US top 10 hit. 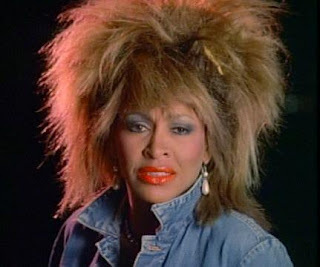 Tina Turner's comeback had been going so-so up until this point. Her remake of "Let's Stay Together" had been a decent-sized hit, although the follow-up - her version of The Beatles' "Help!" - didn't do too well (if it was released in Australia at all). But then came "What's Love Got To Go With It", along with the album Private Dancer. Both would turn out to be massively successful. The single, written by Terry Britten and Graham Lyle, had been offered to everyone from Cliff Richard to Donna Summer to Bucks Fizz (who did record it but shelved it when Tina's version was a hit). When it finally found its way to Tina, she wasn't overly thrilled with its message, but trusted her manager Roger Davies's instinct. Good thing she did - the tune that suggested love was "a sweet old-fashioned notion" obviously connected with a lot of people. The track went to number 1 in Australia and the US, and won Record Of The Year and Song Of The Year at the 1985 Grammys (along with Best Female Pop Performance). The video, which showed Tina strutting around New York in that iconic denim and leather outfit (and big, big hair), also won the MTV VMA for Best Female Video. As well as all its accolades, the success of "What's Love Got To Do With It" well and truly meant Tina's career was back on track - with many years of hits to come. Next week: the arrival of an Australian band that loved to party, plus a single by one local group that was later covered by another and yet another homegrown band remakes a tune originally released by the world's most successful group ever. It's pretty clear from her book I,Tina to the movie of her life, that Tina dislike the song because the broken-hearted stuff harked back to the RnB of her Ike and Tina days - something she wanted to move on from, and embrace a new rock sound. I became acquainted with the Joe Jackson song a couple of years ago via an airing it got in a supermarket, of all places! I knew it was him, but not the title... googled it when I got home and downloaded it. It's quite catchy. 'Tour De France', while sounding ahead of its time, isn't one of my favourite Kraftwerk songs. Maybe I'd like it more if I cared about cycling. Didn't know the Peabo song by name, but of course it's familiar listening to it now. The Tina Turner song is one that best epitomises 1984 for me. Her bird's nest hair in it reminded me of a Sesame Street or Fraggle Rock character at the time. Although she's not fond of it (which I didn't know until now), I prefer it most of her 'rockier' stuff.